This article is about the area in Luigi's Mansion: Dark Moon. For the dome in Super Mario Galaxy, see Garden (Super Mario Galaxy). The Garden is an outdoor area of the Haunted Towers in Luigi's Mansion: Dark Moon. This area can be accessed by taking the door on the right inside the Tool Shed. Originally, the Garden is split into two separate areas by a hedge. Activating the lawnmower on the north causes it to run through the hedge, allowing a way to the other side. The plots of dirt in the garden are filled with flowers and dandelions that yield money. There is a pipe with running water and a topiary shaped as a Boo. Many large vases with flowers and gardening tools are found in the area. There is a hole that Luigi can use to peer into the Toolshed Stairs. The door on the left leads back to the Tool Shed. In The Pinwheel Gate, Luigi needs to go to the Garden to chase after a Hider that has stolen a pinwheel vane. After using the lawnmower to get to the other side, Luigi needs to fight a Gobber and two Greenies. After defeating them, Luigi must fight the Hider to get back the vane. During Graveyard Shift, the dandelions are gone, but nothing else have changed. In Doggone Key, Luigi meets the Polterpup in the Garden after encountering it in the Tool Shed. The Polterpup activates the lawnmower and escapes into the Toolshed Stairs. Before Luigi can chase after it, he has to fight three Sneakers. During Hostile Intrusion, the Garden may be one of the rooms that is infested with ghosts. 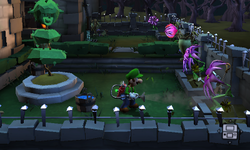 Only during The Pinwheel Gate and Hostile Intrusion, Luigi can use one of the buckets dropped by the Greenies and fill it with water. Taking it to the plant on the bottom right causes it to bloom, and flashing it with the Strobulb yields an emerald.